Players can choose to either join Guilds via invites or create their own for 15 gold and 200,000 amethyst. The Guild Wealth is crucial not only for upgrading the Guild but to keep it open. Because each week Guilds need to pay a Guild membership fee. This fee increases when a Guild is upgraded and if it isn't paid the Guild will lose access to features and eventually be disabled. 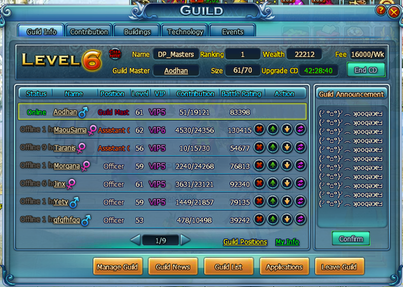 Guild Wealth can also be used for various things besides Upgrading or Guild Fees. Guild members can increase the Guild Wealth or boost the Guild contribution: by donating gold, amethyst as well as by completing dungeons and events. There are several Buildings that Guilds have access to these include: Guild Shop, Guild Warehouse, Guild Academy and Guild Fort. Guild Battle: Allows two Guilds to battle it out in order to win bravery points which can be exchanged for special items. Holy Lands: Guild members can face off against hordes of monsters in order to earn Guild wealth.